Mexican Spotted Owl /Hawks Aloft Inc. The Mexican Spotted Owl is the smallest and lightest plumaged of the Spotted Owls. A bird that prefers cool, moist, mixed conifer forests of Douglas fir, white fir and pine-oak, they are threatened by land management practices that frequently include timber extraction and fire suppression. Considered an “indicator species” for the health of old-growth forests, the loss of these habitats is accelerating the decline of this threatened species. 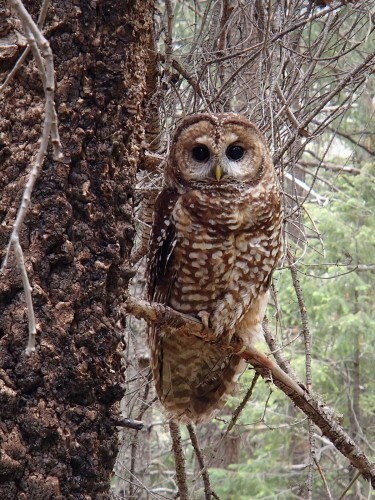 In the aftermath of several western wildfires in New Mexico and Arizona, some of which burned nearly 500,000 acres of forest land, Hawks Aloft was contracted to monitor the burned area and the surrounding buffer zone for Mexican Spotted Owl populations and reproductive success. Researchers attempted to locate previously known and undocumented nests, discovering whether or not the fires had shifted breeding territories. These studies helped determine the impacts of catastrophic wildfire, with a broader impact in determining how this species might respond to wildfires elsewhere.